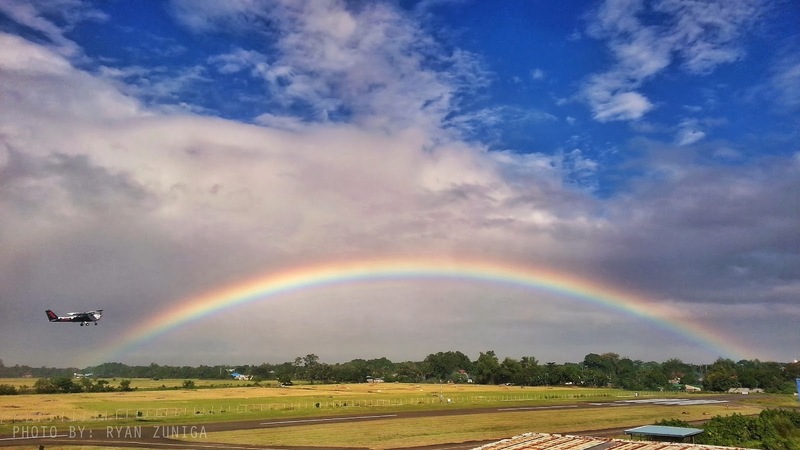 This photo was taken just this morning by my senior, Sir Ryan Zuniga at Plaridel Airport. Thanks sir for allowing me to publish your photo on my blog! It was one of the most beautiful rainbows I have seen. I know that a lot of people have already complained on how inefficient our government is; that the relief operations were slow despite the number of goods coming from different countries. Politics really is a complicated thing. The best thing that we could do right now is to help Visayas rise again in our own convenient ways. You can donate your extra clothes, food, and other basic necessities if you have. In my case, I am willing to volunteer at Tacloban Control Tower. In the name of public service. This is my own little way to help the devastated city since the facility's currently undermanned. I'm pretty sure that Visayas will rise up again and start another chapter of their life. Pero ang dagan sa relief goods, sadly murag mas hinay pa kaysa bao.. Pulitika man gud ba.. tsk tsk tsk.. I think may good future pa din naman, kung hindi lang nila hahaluan ng corruption ang pag-upo nila sa gobyerno. There are purpose and meaning in these things, decipher it, act on it, and move on. Let's not stop helping our people. I like the photo of the rainbow as it evokes hope and you are right, we should just help in our own way and not be bothered by the politics. Rainbow simply symbolizes there is light in the horizon or putting it in a spiritual sphere My say, God is in control. Thank you Lord for the continuous help you are providing us. In your mighty hands your land will rise up again by your will. i myself still complains. i've been living oversea's for 6-7years now and whenever I go back in Philippines It sad that I can still feel how i feel its hard to live in Philippines in terms of money and almost everything. still hoping for the change and i know filipinos are strong! Nice capture of the rainbow. Whenever I see rainbow, it means hope for me. Same thing for the victims of the typhoons, there's still hope and they will rise again. The picture in the postcard means that there's hope and things will be better. After the tragedy in Central Visayas, I hope that our government will step up and do its best to help our fellow countrymen. Awesome shot. I think that is God's way of reminding the people of Tacloban that better days are waiting ahead for them. I salute you for the effort you exerted to help Visayas rise again. Let's hope for the better. Thanks for all of your comments guys! Really appreciate it. Visayas will surely rise again! It's heartbreaking to watch the news about how helpless those who have been greatly affected by Typhoon Yolanda. But in times of difficulty is when we see how people value each one another. And yes, THIS TOO SHALL PASS! Algene huhu won't be flying to Davao on Dec 15 due to my busy sched. Mga third week pa ata ako uuwi (actually aabsent nga ako niyan eh). filipino will always rise no matter what obstacles it will face... let's continue to help them... Yahweh bless. Visayas will surely rise again! With the help of everyone, they can make it. It's just sad that many people complain about our government when in fact they themselves haven't extended help at all. This is such an encouraging post for our fellowmen, God Bless you Renz. Happy New Year!